Elko Corner-notched point, Walnut Canyon National Monument. Click the image to open the Elko Series gallery. Geographical Range: The Great Basin onto the southern Colorado Plateau. 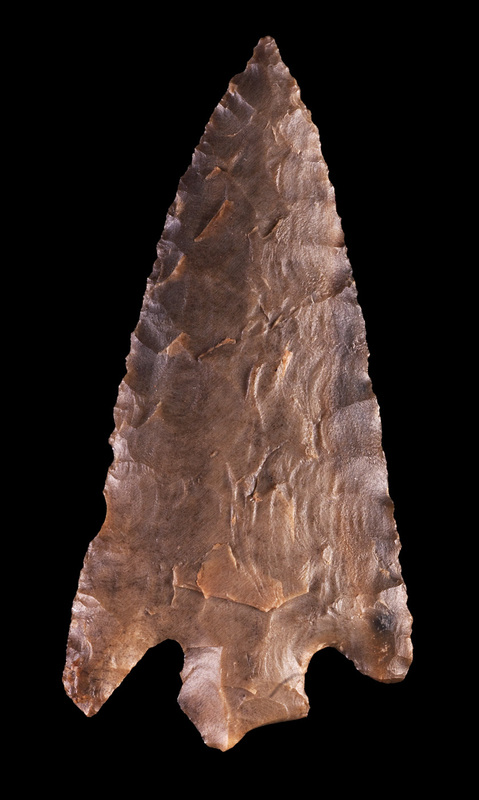 Elko Eared – Average: 35.4 mm long, 21.2 mm wide, and 5.1 mm thick; stem length: 9.5 mm (Lyndon 2005:Table 9). Elko Corner-notched – Average: 41.7 mm long, 23.6 mm wide, and 4.8 mm thick; stem length: 8.9 mm (Lyndon 2005:Table 23); Average: 53 mm long, 29.3 mm wide, and 7.6 mm thick (Shackley 1996:Table 4). Elko Side-notched – Average: 30.22 mm long, 19.9 mm wide, and 5.3 mm thick; stem length: 8.9 cm (Lyndon 2005:Table 26). Elko Eared: Triangular corner-notched points with indented or concave bases and basal ears. Elko Corner-notched: Triangular corner-notched points with convex to straight basal margins. Elko Side-notched: Triangular side-notched points with convex to straight basal margins. Base: Indented, concave, convex, or straight. Notching: Deep side or corner notches; v- to u-shaped. Materials: Obsidian, chert, rhyolite, chalcedony. Other Names: San Pedro, Moquino Side-notched. Comparisons: San Pedro points are narrower, more triangular, thicker in cross-section, have shallow side notches, and relatively smaller convex-based expanding stems. Elko points have large blades, deep corner notches, and relatively large expanding stems. San Pedro points can also have serrations, which are rarely found on Elko points. Shackley, M. Steven. (1996) Elko or San Pedro? A Quantitative Analysis of Late Archaic Points from White Tanks, Yuma County, Arizona. Kiva 61(4):413-432.